BELIEVERS SEEKING WASEELA AND TAWASSUL (INTERCESSION AND SEEKING HELP FROM THE PROPHETS AND PIOUS ONES) EVEN ON THE DAY OF JUDGEMENT!!! Narrated Abu Huraira(R.A): We were in the company of the Prophet (alaihiswalathu wa salam) at a banquet and a cooked (mutton) forearm was set before him, and he used to like it. He ate a morsel of it and said, “I will be the chief of all the people on the Day of Resurrection. Do you know how Allah will gather all the first and the last (people) in one level place where an observer will be able to see (all) of them and they will be able to hear the announcer, and the sun will come near to them. Some People will say: Don’t you see, in what condition you are and the state to which you have reached? Why don’t you look for a person who can intercede for you with your Lord? Some people will say: Appeal to your father, Adam.’ They will go to him and say: ‘O Adam! You are the father of all mankind, and Allah created you with His Own Hands, and ordered the angels to prostrate for you, and made you live in Paradise. Will you not intercede for us with your Lord? They will go to Noah and say; ‘O Noah! You are the first amongst the messengers of Allah to the people of the earth, and Allah named you a thankful slave. Don’t you see in what a (miserable) state we are and to what condition we have reached? Will you not intercede for us with your Lord? In the above Hadith all the prophets commanding to seek Waseela from the next Prophets who come after them. They are not saying : it is shirk to seek Waseela , ask ALLAH directly to help you with your problems! Wahhabi Jahils wake up! From this Hadith we can see that all Prophets aqeedha (beleifs) supports Tawassul and Waseela, and it is Islam to seek Waseela! Since Wahhabism is not correct Islam, they say Waseela is Shirk according to Wahhabi religion! So we see that Seeking Madad (support aid) of Prophets and Pious ones is part of Islamic life! Where will Wahhabis be on the Day of Judgement? Answer: Since Wahhabis deny waseela and tawassul, they don’t get it!, When all Prophets and their nations seek Waseela from the succeeding Prophets until to reach to Last Prophet (alaihiswalathu wa salam), Wahhabis will stay back asking Allah to save them directly (?). 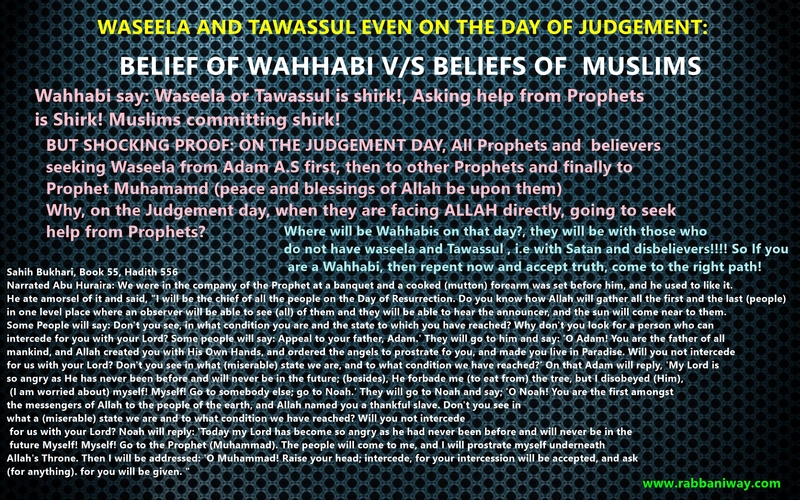 So Wahhabis will be with those who do not have waseela (disbelievers)!!! Quran continues: 2:13 And when it is said to them, “Believe as the people have believed,” they say, “Should we believe as the foolish have believed?” Unquestionably, it is they who are the foolish, but they know [it] not. 2:15 [But] Allah mocks them and prolongs them in their transgression [while] they wander blindly. They wander there blindly, and those who blindly followed them too! 2:16 Those are the ones who have purchased error [in exchange] for guidance, so their transaction has brought no profit, nor were they guided. So stop fooling around with Wahhabi/salafi/ahle hadith sects!